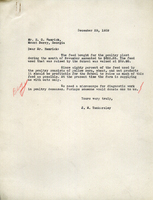 A letter telling Mr. Hamrick that the school needs to raise more poultry feed consisting of yellow corn and wheat in addition to raising oats. He's also requesting a microscope so that they can investigate poultry diseases. 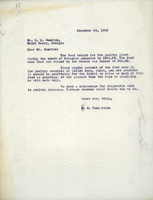 A letter informing Mr. Hamrick of the need for the school to transition to the raising of yellow corn, wheat, and oat as possible for the feed for the poultry plant. Also the request for a microscope for the diagnostic work in poultry diseases. 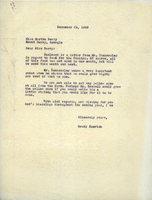 A letter stating that Berry could grow about 80 percent of the feed they use for the poultry if Martha wrote a letter to Mr. Russel saying she wanted it done. L. R. Oakes writes to Martha Berry saying that he's unable to donate right now because of his personal financial situation.